With its central location, Travelodge Southbank Hotel is within easy reach of most tourist attractions and business addresses in Melbourne. The 275 guestrooms at this 4-star hotel provide all the essential amenities needed by the business and leisure traveler. Each of The Travelodge Southbank Hotel's guestrooms offers non smoking rooms, air conditioning, inhouse movies, desk, hair dryer, ironing board, television LCD/plasma screen. Guests can experience the high standards of comfort while staying at this luxury Melbourne hotel with everything they need right on the site such as shops, elevator, laundry service/dry cleaning, meeting facilities, restaurant. 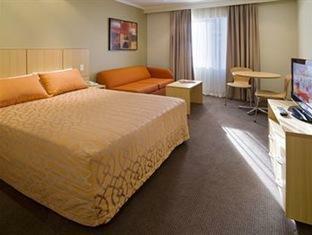 The Travelodge Southbank Hotel provides a warm and welcoming service of international standard. To proceed with this reservation at the Travelodge Southbank Hotel, please enter your visit dates and follow our secure online reservation form.